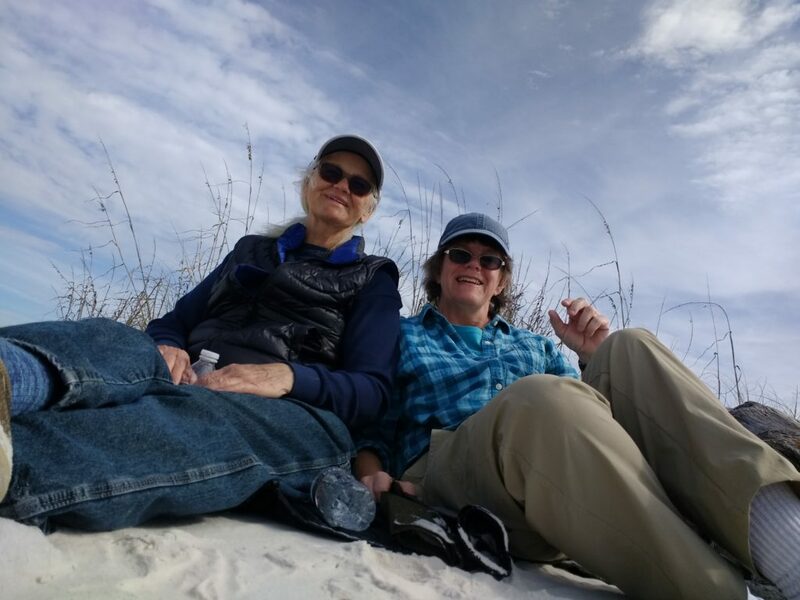 The next week of camping with Carol and Ann was spent at T. H. Stone Memorial St. Joseph Peninsula State Park in Florida on the Gulf of Mexico across from the town of Port St. Joe. 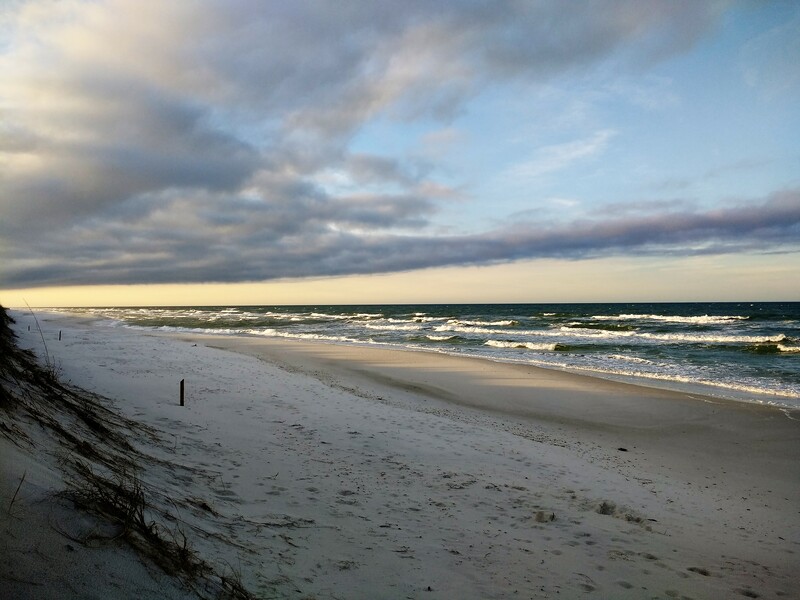 The park is a 9.5-mile-long peninsula with white sand beaches with crystal clear aqua blue waters. 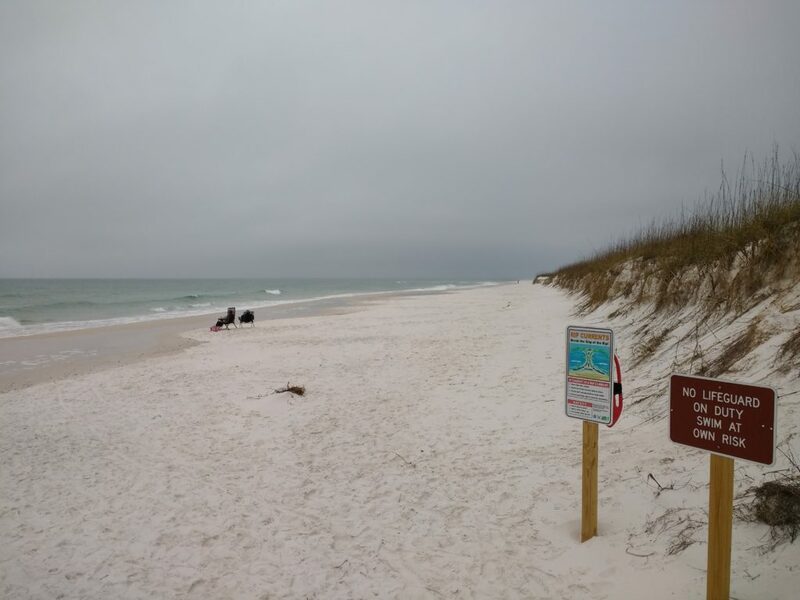 The beach at this park was rated as one of the best in the nation and the state park itself is rated as one of the best in the US. 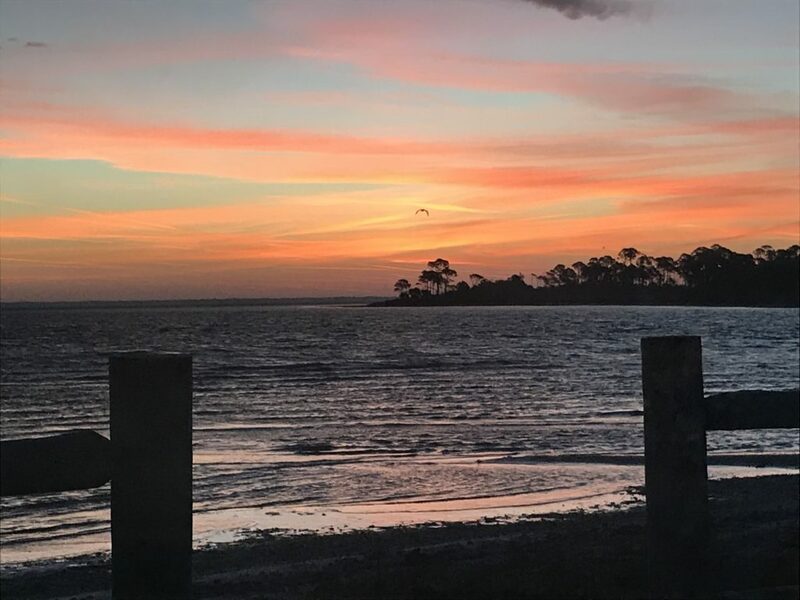 We had learned about this state park from one of the RV travel bloggers that we regularly read, and it sounded like a place we wanted to go! The park had a few nice boardwalks that were ADA accessible. One of the boardwalks was a half mile long and meandered through the flatwood pines and shrubs to the other loop in the campground. 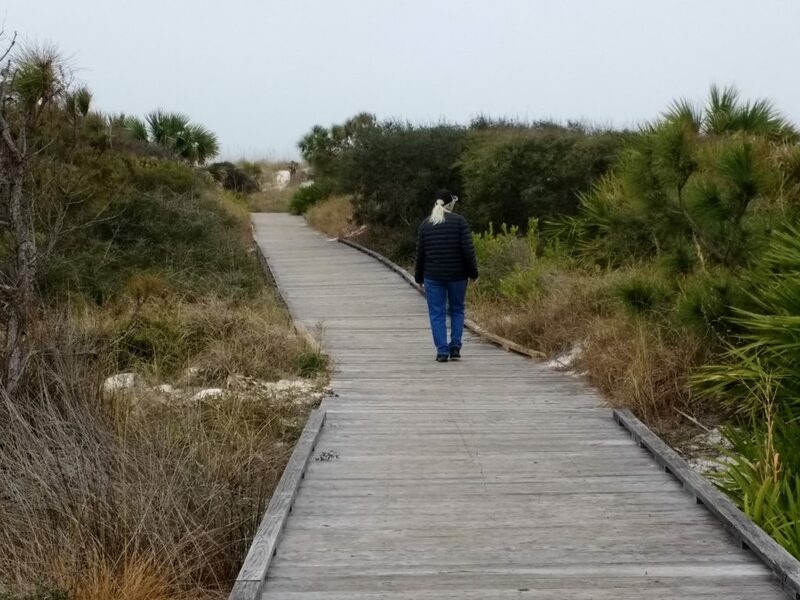 There was also boardwalk access to the beach from both campground loops. Along the way you could sit on one of the benches to view the wildlife and birds. There were several hiking and biking trails throughout the park. 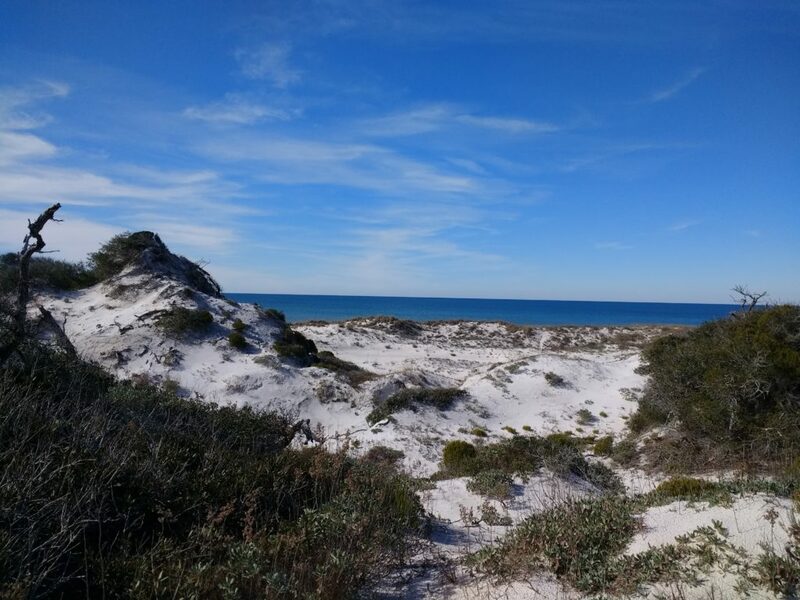 One of the trails that we really liked swept through large sand dunes of pines and shrubs and ended at a beautiful, desolate white sand beach. 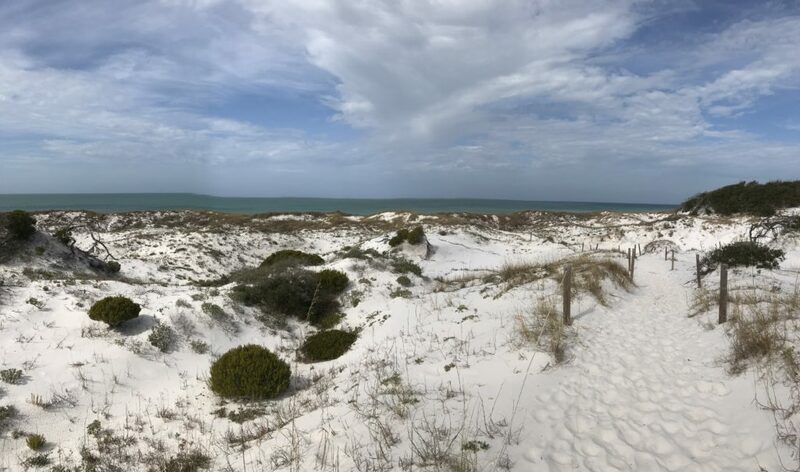 If you like having the entire beach to yourself, then St. Josephs may be the place for you – of course we were visiting during the winter months – it may be totally different in the summer. We sat for a long while to enjoy the peace and solitude. 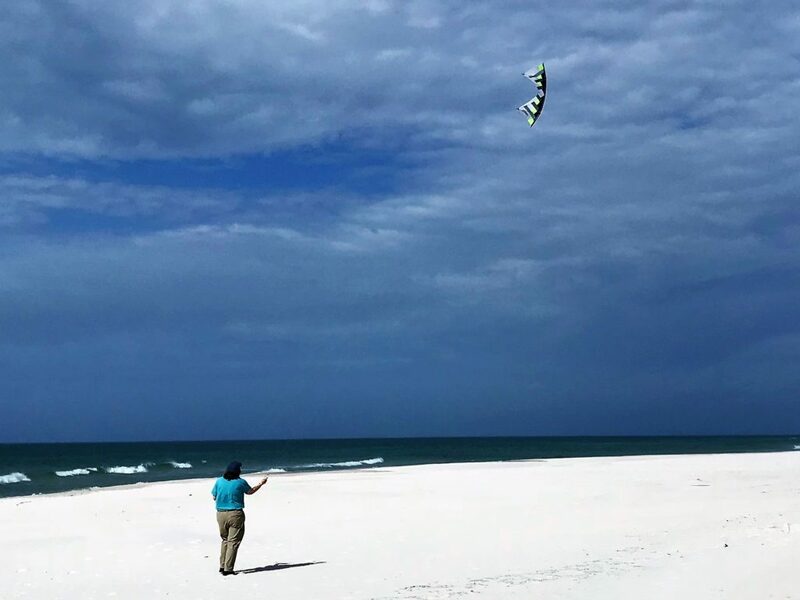 We enjoyed flying our kites at this spot and found it worth the quarter mile hike to it. This beach was wide enough for two people to fly side by side. Kathy flying earlier in the week when it was much colder! It was a bit chilly at the start of our week at T.H. Stone, however it warmed up and we were able to enjoy the beautiful park. Ann said last week was our week of culture and this week was our week of nature! We did see several birds in this park and lots of surf fishermen. 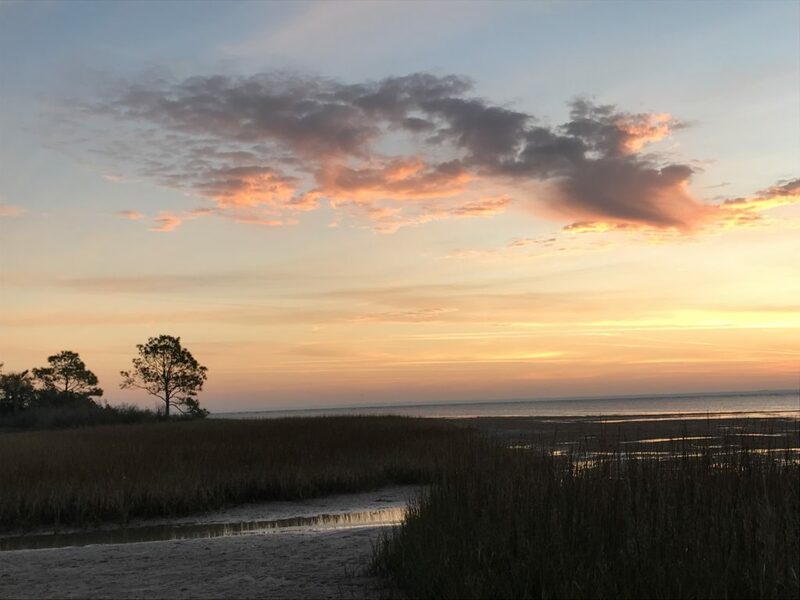 One morning we got up early to view the sunrise on the St. Joseph Bay side of the park and were lucky to get a great sunrise! We drove to the bayside of the peninsula to watch this sunrise. We sipped our coffee while watching the sky turn pink. What better way to enjoy your morning cup of java! Another sunrise view looking over some of the grasslands and marshes. 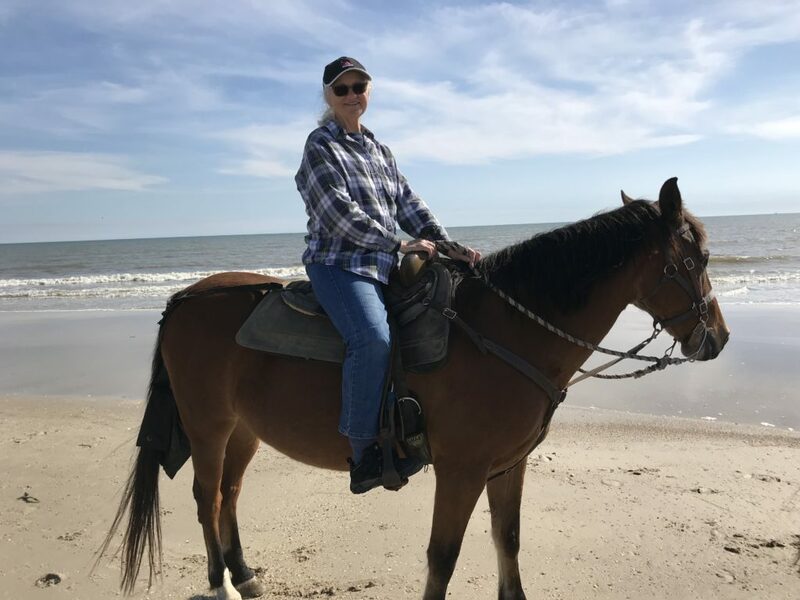 One of the things that has been on our lists of things we want to do is to ride horses on the beach. Many of you know that we used to have horses and go riding quite a bit. 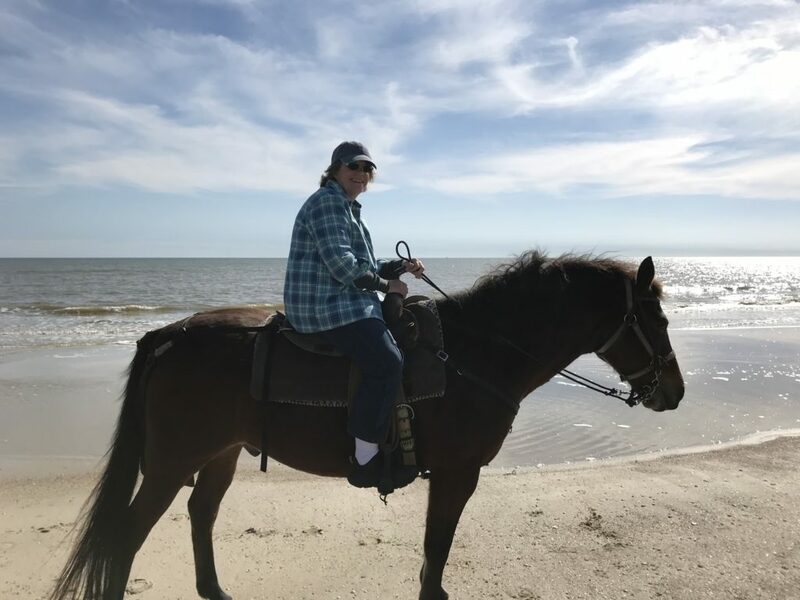 We were finally able to fulfil this dream and we went on a one-hour trail ride along the Gulf of Mexico and the two of us were the only ones signed up for the ride! The ride was enjoyable, and we had a great day for it! Not much skill required but riding along the water’s edge was serene. And the sun was shining which made it even more special. One afternoon we hiked the Maritime Hammock trail which was a scenic walk along the bay through sand scrub and a coastal hammock. We saw lots of interesting vegetation. 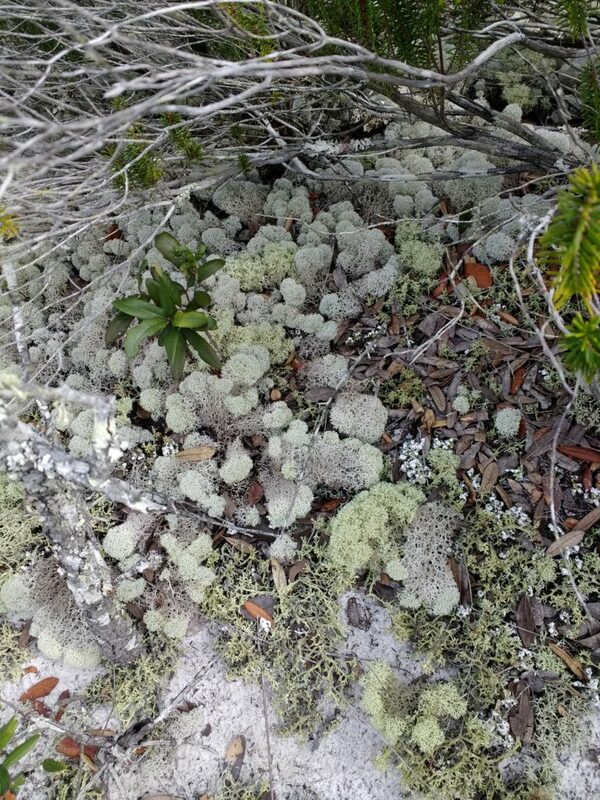 We saw this and think it is some type of lichen. 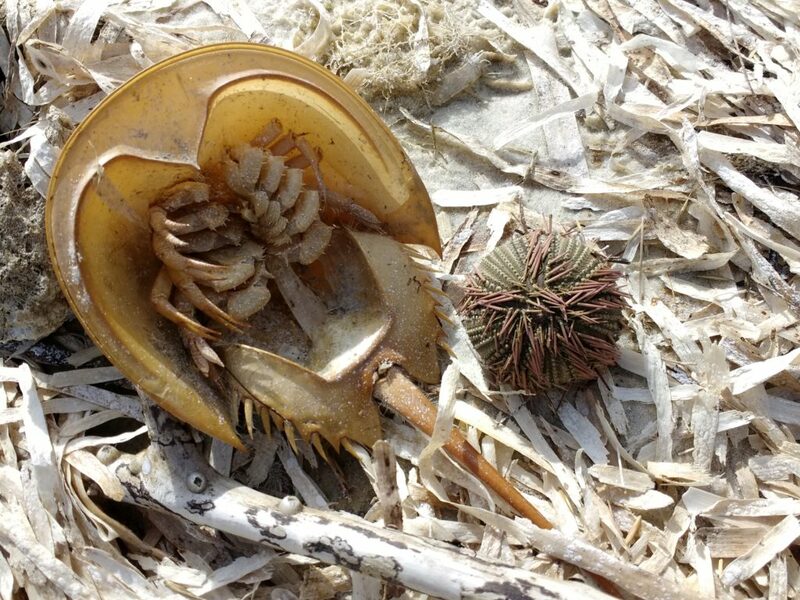 Along the trail on the bayside, we found a horseshoe crab and lots of these little things. Carol later identified them as sea urchins. 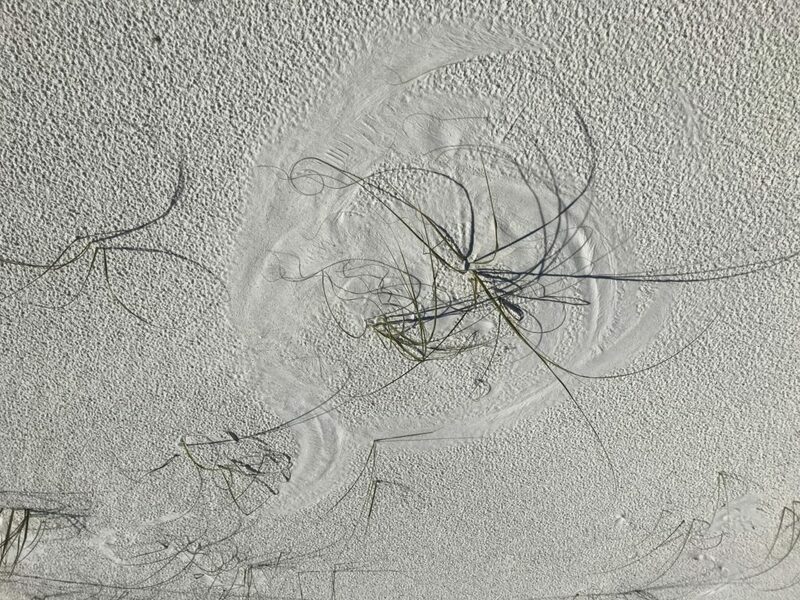 The wind swept grasses made delicate sculptures in the sand. What a great time we had camping with our friends in this lovely park. 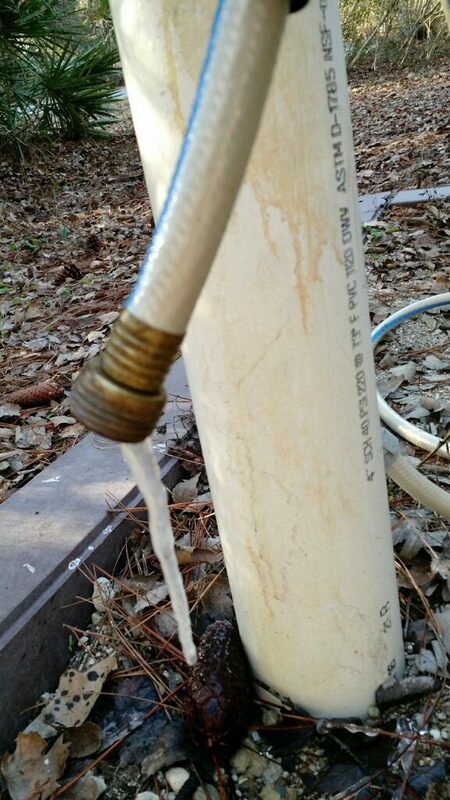 This entry was posted in Florida and tagged St. Joseph State Park. Bookmark the permalink. Another hidden treasure of a state park discovered…beautiful. See you later this month. Thanks Gordon. 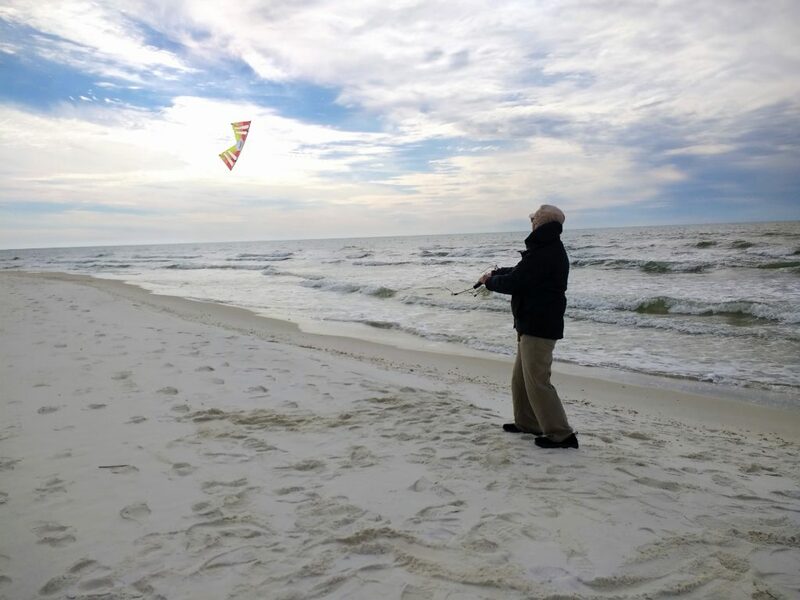 You and Lida would like flying kites here. It is indeed a beautiful place. Looks like a great park with many interesting things to do! Yes we really liked this park and may come back some day. There was lots of biking, hiking and of course, good kite flying!